Yeastar TA FXS Gateway helps you to connect to Skype via Skype Connect. 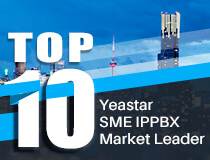 By adding Skype Connect to Yeastar TA, your business could save on your communication costs with little or no additional upgrades required. Once the Skype SIP trunk is registered on Yeastar TA, you are able to make and receive calls on the analog phones through the Skype SIP trunk. This guide has been tested with Yeastar TA3200 and describes how to connect Yeastar TA to Skype with Skype Connect. Before configurations on Yeastar TA3200, you need to set up a Skype Manager and buy a SIP profile from Skype. Please refer to Skype Connect Quick Start Guide to set up the SIP profile on Skype. After setting up the SIP profile, take the SIP account to register on Yeastar TA3200. Step 1. Edit the VoIP Server template on the Yeastar TA3200. Step 2. Edit the Dial Pattern Template. Set the Dial pattern as "0. ", which matches any phone number starts with digit "0". Step 3. Edit the FXS port. Choose the Primary Server Template as the one you edited on Step 1 and fill in the Username and Password info according to the SIP profile on Skype. Number: Same as SIP User on Skype SIP profile. Primary Server: Choose “Skype(1)”, the VoIP that you configured on step 1. Authentication Name: Same as SIP User on Skype SIP profile. Template: choose “Skype_Out(1)”, the one you edited on Step 2. Save and apply the changes, and you will see the port 1 status is “Registered” on "Port Status" page. Step 4. Make a call from the analog phone which is connected the FXS port 1. You can call 001760-660-4690 to test audio quality and connectivity. It’s Skype’s echo test online number. Note: If you want to receive inbound calls with Skype Connect, please proceed to Chapter 2; if not, you have now successfully set up your Skype for SIP profile to make outbound calls. 1) Create a new business account in Skype Manager. For more information on creating a new business account, please see the Skype Manager User Guide. 2) Click View profile next to the name of the SIP Profile to which you want to add the business account. 3) Click Set up incoming calls. 4) In the Add business Account tab, enter the newly created business account's name and fill in the extension number which number will use to receive the call. Step 2. Set up the online number on the Yeastar TA3200's FXS port. Online number: fill in the extension number which you configure in Skype Manger. All calls from other Skype users to this account (yeastar.neogate) will be routed to the analog phone which is connected to Yeastar TA3200's FXS port 1. 1) Click View profile next to the name of the SIP Profile to which you want to assign an Online Number. 2) Click Set up incoming calls. 3) Click Buy a new number. 4) Complete the on-screen instructions to buy the Online Number. For more information on buying a new Online Number, please refer to the Skype Manager User Guide. Online number: Fill in the Skype online number which one buy from Skype. E.g. : online number is 05925503309. When someone calls the online number associated with the SIP profile from a landline or mobile phone, the call will be routed to the analog phone which is connected to TA3200's FXS port 1.